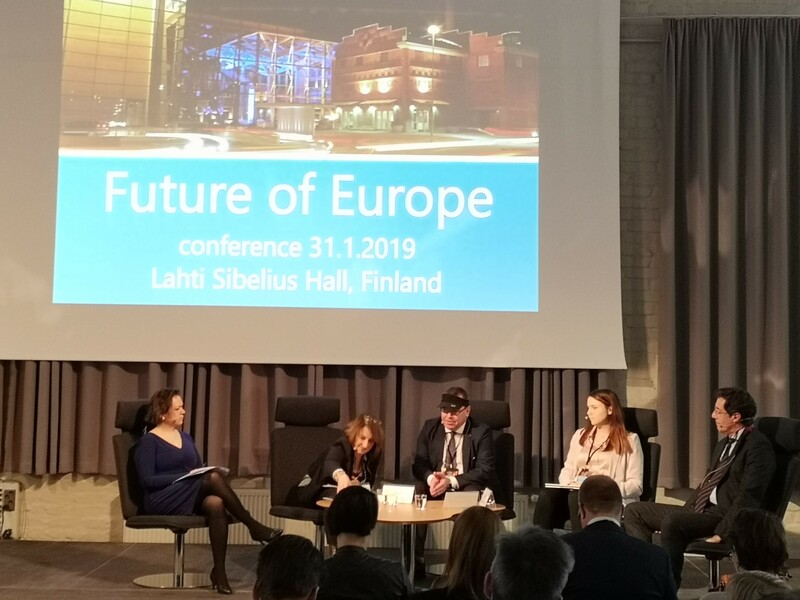 The Regional Council of Päijät-Häme, the Regional Council of Oulu, the CPMR Baltic Sea Commission, and the Representation of the European Commission in Finland, organised a high-level conference on the Future of Europe on 31 January 2019. The conference was held in the magnificent Sibelius Hall, in the beautiful city of Lahti, Päijät-Häme, Finland. The event brought together 140 high-level politicians and representatives of the European institutions, Member States, and Regional Authorities from all over Europe to discuss what Europe’s leading political representatives think about the role of Baltic regions in the future of Europe and how the Baltic regions can have their say in the revision of the EU Strategy for the Baltic Sea Region and the post-2020 EU Budget negotiations. The meeting started with a video presentation by Alexander Stubb, Vice-President of the European Investment Bank, who gave a keynote speech on “The EU in a world of disorder”. He addressed the disorder in Europe, and the importance for the EU to take leadership in a few issues, including values, fundamental rights, and freedom. He discussed the current situation in the United States of America and Great Britain, as well as multilateralism and trade, noting that the EU-Japan trade agreement will be one of biggest in the history of world trade. The morning session was moderated by Saara Mettero, Public Affairs Director, The State Development Company Vake Oy. Laura Leppänen, Regional Mayor, Regional Council of Päijät-Häme, gave a welcome speech and noted the current challenges that Europe faces, and the importance for this conference “to learn about current developments in the EU agenda…it is an opportunity for regions to come together and discuss the future of Europe and European governance” and that “The CPMR has offered us a very good place to cooperate with other regions across Europe”. Anne-Mari Virolainen, Minister for Foreign Trade and Development gave an opening speech on the challenges and possibilities for the EU in spring 2019. She commented that “respect of human life, rule of law, respect for human rights, values, are under attack in Europe and worldwide…Nothing lasts without values.” She stated that Security Policy is one of the Eu’s successes, the EU is one of the pillars of world security. She told participants that “it is unquestionable that the EU is facing the most challenging year of its contemporary history. We can face the challenges ahead if we stay faithful to our values”. A panel discussion was held on European action for citizens, growth and the future. 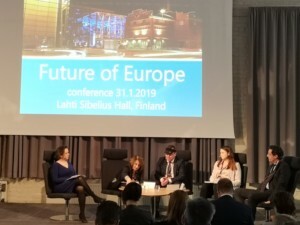 The panel members included Eleni Marianou, Secretary General of the CPMR, Erik Bergkvist, President of the Regional Development Board, Region Västerbotten, Mikel Landabaso, Director of Strategy and Corporate Communication, European Commission and Maria Nyroos, representing the National Union of University Students of Finland. The panel discussed how to raise voting in the elections, how the youth can be more involved, and climate change. The panel members also looked at the future, what European solidarity means to them, what has been learnt from the migration crisis and the role of the regions. 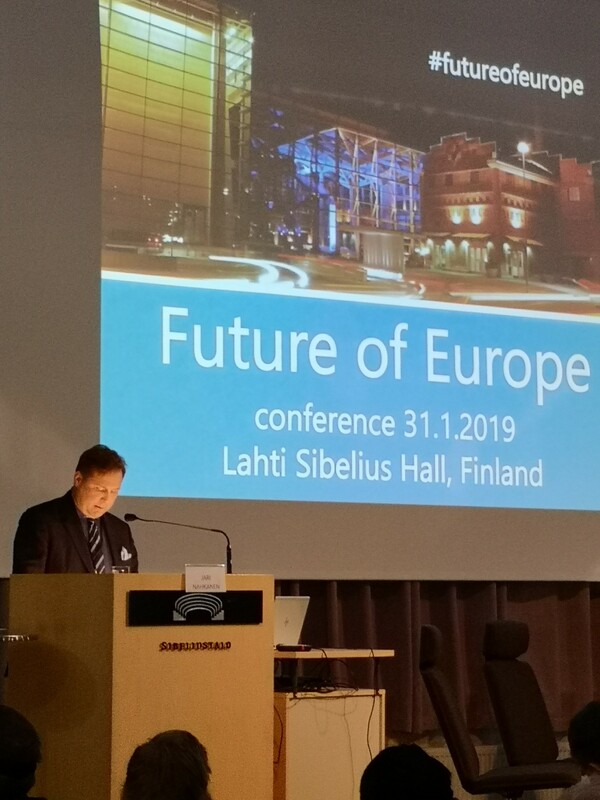 Following the panel discussion, Jari Vilen, Ambassador, Senior Advisor for Arctic Policy, European Political Strategy Centre, European Commission, took the floor to speak about the future of the Arctic Regions in the EU. He informed participants that “the arctic is an integral part of the next European Commission global agenda and the Finnish European Presidency agenda”. He highlighted that climate action starts with the arctic, with balancing sustainable economy and nature. He stated that it is vital to secure the future success of indigenous people. Jari Nahkanen, President of the CPMR Baltic Sea Commission, gave a speech on the Baltic Sea Region in the EU. He acknowledged the challenges and possibilities offered by the Finnish Presidency and the need to safeguard and reinforce both multi-level governance and shared management through the EU Strategy for the Baltic Sea Region. He stressed the importance of helping Africa to become the continent of the future. The Conference continued in the afternoon with three thematic seminars: “Citizens’ role in the Future Europe”, organised by Allianssi – Finnish Youth Cooperation Network; “What is the place of regions in the revised European Union Strategy for the Baltic Sea Region?”, organised by the CPMR Baltic Sea Commission and the Regional Council of Päijät-Häme; and “Baltic Sea Region and Smart Specialisation/S3: Planning ahead for the EU’s post-2020 proposals”, organised by the Region of Västerbotten. The grand finale of the Conference was a spectacular concert by the Lahti Symphony Orchestra.